Although the archaeological layers filling the former entrance into Bone Passage are so far fairly sparse in actual artefacts, we have recovered a few more finds. 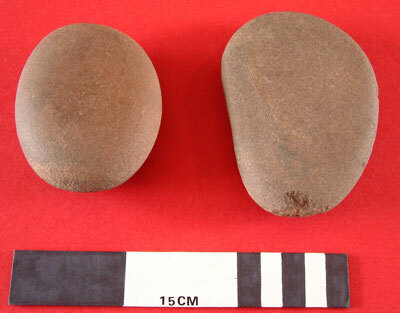 Most of the finds are coarse stone tools comprising pebble hammers and grinders, manufactured from Torridonian Sandstone blanks. These blanks have been imported into the High Pastures site, most likely from the beach at Camas Malag - situated some 0.75km to the south west. The tool shown above is a pebble grinder, which has two distinct ground facets - bottom of tool in picture. We cannot be certain of the function of these tools, but they are a relatively common find on prehistoric sites of this period. The two pebble tools shown above are a grinder (left) and a combined grinder/hammer (right). We also recovered a possible fragment of a rotary quern stone from the trench. If so, this item was never used - having no ground surface on the underside. Finally, we found our first fragment of unburnt bone from the fill of the entrance on the 15th April. 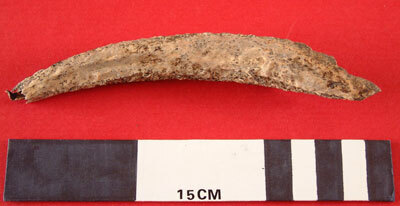 The almost complete red deer antler tine was recovered from the NW sector of Trench 2. My son found a small hard stone pebble (about 1 inch long) that looks to be inscribed. If this is your area of expertise I would like to send pictures for your evaluation. The bone looks to be in a remarkable state of preservation. 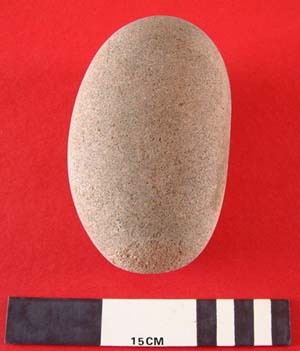 The Torridonian Sandstone pebble grinder looks very impressive cleaned up and to think we were the first to see and touch this artefacts since it was deposited and now found in the archaeological record.